In recognition of Fatou Bensouda’s recent election as Chief Prosecutor of the International Crimial Court (ICC), SEN Jounal: Online Exclusives is delighted to present excerpts from SEN’s interview with Mrs Bensouda, originally published in Volume 11, Issue 1 (April 2011). 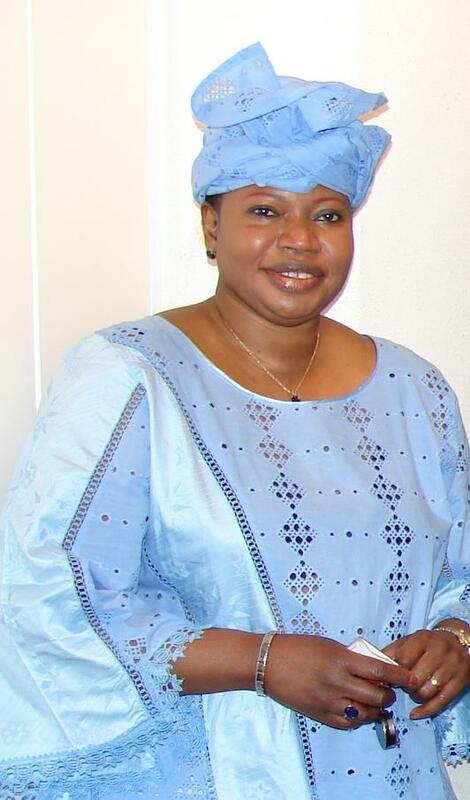 Before becoming Chief Prosecutor in December 2011, Mrs Bensouda served as Deputy Prosecutor to the ICC from 2004. Drawing on her long-term experience in the Court as well as her previous diverse career in Gambia and at the ICTR, Mrs Bensouda highlights the need to see the ICC as part of an international criminal justice system that relies on the principle of ‘complementarity’ between international institutions and state parties. In addition, Mrs Bensouda argues that, instead of seeing the relationship between African states and the ICC as one of tension, Africa has in fact been taking a leading role within this particular justicial mechanism. The commitment of African state leaders to international criminal justice has been reaffirmed through their participation in the Review Conference in Kampala as recently as June 2010. SEN: In order to start, Mrs Bensouda, could you give us a brief description of your career path into the ICC and your [then] current role as the Deputy Prosecutor? SEN: What are some of the other challenges that the Deputy Prosecutor faces? Bensouda: … in my [previous] role, [challenges] start with the investigations. You need to remember that you are conducting investigations during on-going conflicts. The office of the Prosecutor is set up in such a way that prosecutors are not just confined to prosecuting the case in the Court. In fact, from the very beginning, when or even before the Prosecutor announces the prosecution, our division plays a role when the information is collected. We give legal advice during the analysis phase of the case … there are often many logistical obstacles that we face during investigation. In the Darfur case, for example, we had no access to the crime scene. We had to consider how to approach victims without endangering them. We had to consider particular implications, and we have to do this, not only in the Darfur case but in all situations, without drawing attention to what we are doing or to those we are interacting with … Another challenge for us is the communication with witnesses. This means that we have to find people who are qualified to interpret often complex legal terms … witness security is very important for us. It is the highest priority for our office. When we investigate, we have to make sure that these witnesses are protected; that they are not exposed. In all these years of investigations, thankfully, no ICC witness has been attacked, and this is something we have to keep this way. Another significant challenge of course remains the executing of arrest. The ICC as in institution has a mandate, but we have no army, we have no police. Arrest continues to be the obligation of state parties and it is not always easy for us to have a body brought to court for ICC prosecution to start. SEN: As one of the main criticisms against the ICC, do you think the issue of enforcement could or needs to be solved? As part of our current focus on nationalism, ethnicity and art, SEN Journal: Online Exclusives is delighted to present an exclusive interview with Professor Anthony D. Smith. Professor Smith is the author of numerous highly regarded works on nationalism, including inter alia “The Ethnic Origins of Nations”, “Nationalism and Modernism” and “Chosen Peoples: Sacred Sources of National Identity”. Professor Smith has always maintained a strong interest in art, and his upcoming book “The National Made Real: Art and National Identity in Western Europe, 1600 – 1850” will be published by Oxford University Press next year. Sonia Morland met with Professor Smith to ask him some questions about nationalism and art. 1. Thank you for agreeing to this interview, Professor Smith. Perhaps to start off with, would you be able to tell us what draws you to the topic of art and national identity? I’ve always been interested in nations and nationalism and also art and sculpture. I did a diploma at the University of London in the early 1970s on the History of Art, followed by a Ph.D. on historical revival of painting and sculpture in England and France, 1750–1800. So my interests in art have been longstanding and I thought I’d like to combine these two interests now that I have more time in my retirement. 2. Can you describe the relationship between art and national identity? The rise of nationalism coincided with two artistic movements in the late eighteenth and early nineteenth centuries: neo-classicism and romanticism. This period particularly interested me for its variety and radical innovations artistically. My book [The National Made Real: Art and National Identity in Western Europe, 1600–1850, Oxford University Press, forthcoming] attempts to explore the links between artistic developments and the rise of nationalism in Western Europe, starting with the Dutch in the seventeenth century and moving on to the British and French, as well as Germans and Scandinavians, in the late eighteenth and early nineteenth centuries. 3. Is there anything that is particular about visual art in its relationship to national identity – for instance in comparison to music or dance? The imagery of visual art is more public, permanent, and often more immediately accessible to a large number of people than works of literature and classical music and, for these reasons, may help to shape the visualisation of the nation. The concept of a nation is highly abstract and so are the ideals of nationalism (autonomy, identity, and unity), and to be grasped by most people, they require embodiment and location. Hence the importance in this period [the late eighteenth and early nineteenth centuries] of ‘history painting’ and ‘landscape painting’. In ‘history painting’, artists depicted the virtues of heroes and heroines of the national past as truthfully as possible in their ‘authentic’ settings. In ‘landscape painting’, artists sought to portray their homelands in all their distinctive variety. 4. Can you describe/discuss a particular artwork that inspired a national identity? No artwork can be said to have inspired a national identity but certain artworks have heralded and summed up a growing sense of national identity. The most famous is probably the ‘Oath of the Horatii’ (1784) by Jacques-Louis David (right). 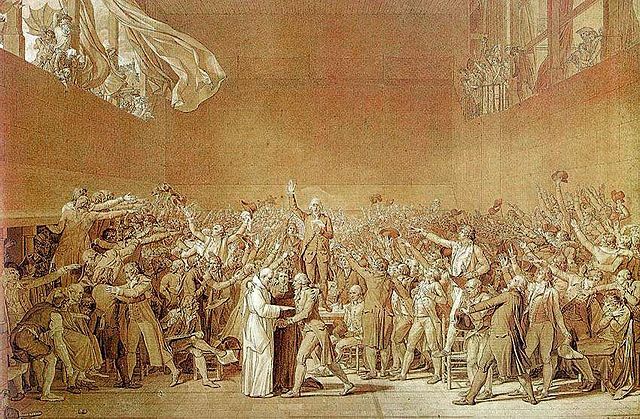 In 1790, the first year of the French Revolution, at the Fête de la Fédération, the participants re-enacted the celebrated oath of the three Horatii brothers. This must be the only case of an artwork inspiring a solemn moment of political ceremony. Other works which have achieved iconic status include ‘The Hay Wain’ (1821) by John Constable (below) and ‘The Fighting Temeraire’ (1839) by J.M.W. Turner. There are also the paintings of Akseli Gallen-Kallela in Finland during the 1890s, which show scenes from the heroic Finnish epic, the Kalevala, which inspired Finnish nationalism. 5. Can you describe/discuss a particular artwork that was inspired by a sense of national identity? There are a number of artworks which record scenes of national independence and unity. Again, one of the best known is David’s ‘Oath of the Tennis Court’ (1791) (left), another is Delacroix’s ‘Liberty Guiding the People’ (1831). 6. How did pieces of art come to be regarded as national art – is this purely a matter of chance? This varies considerably. 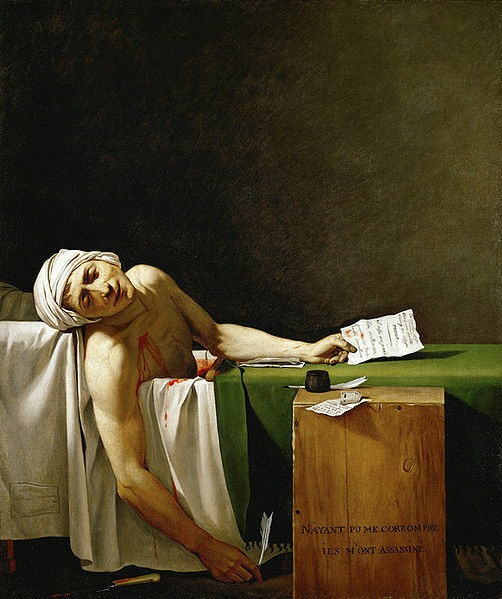 Some works of art were commissioned by the state for nationalist purposes, e.g., many of David’s works (such as ‘The Death of Marat’, 1793) (right). 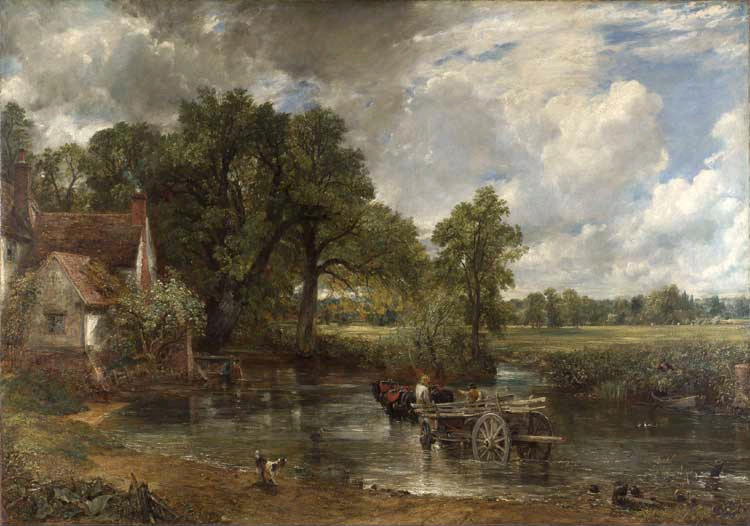 Others gradually came to be regarded as national works over several generations because they were perceived to have summed up an aspect of the sense of national identity, e.g., Constable’s ‘Hay Wain’. Others were commemorations of national heroes, for example, Benjamin West’s ‘The Death of General Wolfe’ (1770). There were also many tombs of famous people in the Panthéon, Paris, and St Paul’s in London, and the tomb of Alfieri (1806) by Antonio Canova. 7. How did the creation of national galleries affect the interplay of artwork and national identity? This was extremely important, and the timing of their creation, in the middle of the process of national revival, greatly encouraged the growth of national schools of art in Germany, the Scandinavian countries, Spain, Russia, and Mexico. By gathering works of art of both native and foreign schools under one roof and opening their doors to the public, the directors of national galleries greatly enhanced the sense of cultural distinctiveness and national identity amongst both the artists and the art loving public. In addition to the galleries, the Salon in Paris and the Royal Academy in London, in their annual and bi-annual exhibitions, did a great deal to foster a sense of national, cultural identity, often a deliberate policy of the state elite. 8. Can you tell us about the role of the artist in the construction of national works of art? It is extremely difficult, particularly in the case of artists living over a hundred years ago, to have any idea of their motives. Inevitably, these would have been mixed: the desire for state patronage, the need for remuneration, rivalry with other artists, the widespread fascination with classical and medieval history, and the growing interests in landscape and rural genre art. And, of course, the effects of prolonged war encouraged much national art. All these played a part alongside any genuinely patriotic feeling. 9. Do you think ‘classical’ and ‘modern’ art are equally useful styles to communicate ethnic and national identity? Insofar as nationalism requires well-defined images of national community and identity, traditional styles are more obviously relevant and better suited to the nationalist message. If by ‘modern’ is meant ultra-modernistic and post-modernistic styles, these tend to be less well suited to the nationalistic message, except as designs for emblems, logos, etc. There are exceptions to this, such as the work of Sidney Nolan in Australia. In an age where cosmopolitanism and global pressures are pervasive, the nationalist message has been put in doubt, and post-modernism, by its often ironical and pastiche-like quality, reinforces this sense of estrangement from the idea of the national community and national homeland. 10. If art captures something deep about national identity, the type of art to be investigated should not be limited to those belonging to ‘high culture’. What is your view on the potential of investigating popular forms of art in the study of national identity? I agree. In fact, there has been a good deal of investigation of popular forms of art. They started with the satirical newspapers in Britain and Revolutionary France and went on to posters in the Russian Revolution, andfilms, like Brogan’s 1915 ‘Nation of America’ and Eisenstein’s ‘Battleship Potemkin’, ‘Alexander Nevsky’, and ‘Ivan the Terrible’. All images courtesy of Wikimedia Commons. Noted scholar and SEN Journal contributor Dr. Khaled Fattah, left, recently answered questions on the fractious state of tribalism in Yemen. Dr. Fattah is a guest lecturer at the Centre for Middle Eastern Studies at Lund University in Sweden. He holds a PhD in international relations from the University of St Andrews in Scotland. Dr. Fattah is often quoted in international media as an expert of Yemen and state-tribe relations in the Arab world. His forthcoming book is entitled “Tribes and Revolutions in the Middle East”, Hurst Publications, London. Why did the Yemeni state fail to overcome tribalism? The failure of the Yemeni state to overcome tribalism is intimately linked to its failure to transform tribesmen into citizens. This failure is attributable, mainly, to state fragility and economic underdevelopment. The Yemeni state is so fragile that it lacks the basic infrastructural power to penetrate society, enforce it well and perform its core functions. It is important to note the difference between tribalism as cultural identification, and tribalism as political identity. As a cultural identification, tribalism is expressed in collective traditions and rituals which provide tribesmen and women with feelings of solidarity, frames of reference and views of meaning. It is the politicisation of tribal cultural identification which turns tribalism into a damaging force against good governance, progress and democratisation. Another reason behind the failure to overcome tribalism in Yemen is the Saudi factor. During the last five decades, the Saudi political administration has been promoting tribalism in Yemen as a counterbalance to possible political threats that may emerge from modern social forces in Sana’a. For example, hundreds of Yemeni tribal leaders are included in a vast network of Saudi patronage system. Did President Saleh’s strategy of regime maintenance actually help cement tribalism? Or did he try to overcome it? Saleh’s strategy of regime maintenance has been exclusively guided by survival, even if survival means radical shifts in posture and policy. Tribalism in Yemen is conjoined with politics of survival. In general there are four main approaches which colonial and post-colonial regimes in the Middle East have applied in dealing with tribes: destruction, co-optation, subordination and manipulation. Due to the fact that tribes of Yemen are armed to the teeth and state resources are very limited, Saleh’s regime applied the cooptation approach as one of its main instruments in dealing with tribes. As a result, tribal leaders became powerbrokers who enjoyed influence far beyond the borders of their tribes. Instead of modernising the tribe, Saleh’s regime promoted and encouraged the tribalisation of all agents of political modernisation; namely state institutions, the military and political parties. Which tribes supported Saleh, which ones did not – and why? There are more than 190 tribes in Yemen. Each tribe is divided into sub-tribes, clans and extended families. However, for security, economic and political reasons, a number of tribes united into one confederation. In Yemen, there are three major tribal confederations – Hashid, Bakil and Medhej. Saleh comes from Sanhan, which is a clan within the influential tribal confederation of Hashid. During the last three decades, Saleh relied on the tribal support of his clan and confederation to maintain and consolidate his power. In the current uprising, however, Saleh lost the support of many of the influential tribal leaders of Hashid, including the al-Ahmar family which is the most powerful tribal family in Yemen. Clearly, tribes that were marginalised by Saleh’s regime and tribal elites whose interests clashed with the interests of Saleh’s immediate family constitute a major military and financial resource for supplying and complicating the ongoing anti-regime protests. During the last few months, Saleh’s regime depended mainly on the military power of the Republican Guards – commanded by his son, Colonel Ahmed – and on the Central Security Forces who are led by his nephew, Colonel Tareq. The uprising in Yemen revealed in a very clear manner how Saleh’s regime is a tribal regime. Can tribalism contribute to political stability? Though culturally rooted, tribalism is an identity which is shaped politically. It is, however, subject to constant adjustments to security, economic, ecological and political circumstances. It is a fluid and flexible identity and carries with it both positive and negative features. Tribes become sources of instability when the central government does not respond to tribal grievances. In the case of Yemen, the chronic absence of a strong central authority made the tribe the best alternative for fulfilling the primary functions of security provision and conflict management. Tribes of Yemen have often acted as safety networks that provide not only reliable social welfare to their members, but also protection against state authoritarianism. In my view, there can be no stabilisation in tribal societies of the Middle East without political reforms based on constitutional legitimacy, and the successful promotion of active citizenship. What makes Yemen’s uprising different from other uprisings such as in Tunisia, Egypt, Syria or Libya? There are a number of features that sharply distinguish the Yemeni uprising from the uprisings in the rest of the region. First, it is an uprising that took place in a fragile political entity, with the worst indicators of economic and human development in the region. Compared to other countries where the ‘Arab Spring’ appeared, Yemen has the lowest rate of urbanisation and the smallest middle class. Second, on the eve of the uprising, the map of Yemen was already dotted with numerous spaces of disorder and was fissured with pockets of violence. As a result, the uprising created the opportunity for insurgents, terrorists and militias to flourish and expand. Third, the peaceful Yemeni social intifada has been transformed from being a youth-led uprising into a power struggle between rival elite factions. Fourth, unlike the other Arab countries in which popular protests blossomed, in Yemen there are two militaries involved – one remains loyal to the Saleh regime, the other supports the protesters. The Yemeni military is so tribalised that it mostly reflects tribal coalitions, not state power. Finally, the transitional period in Yemen is threatened by the absence of individuals, groups or institutions that are capable of exercising authority and managing the complex socio-political landscape. Dr. Khaled Fattah, left, recently answered questions from ASEN intern Sonia Morland on behalf of SEN Journal. Dr. Fattah is a guest lecturer at the Centre for Middle Eastern Studies at Lund University in Sweden. He holds a PhD in international relations from the University of St Andrews in Scotland. He is often quoted in international media as an expert of Yemen and state-tribe relations in the Arab world. What would you say were the underlying and proximate causes of the current protests in Yemen? Dr. Fattah: The roots of the popular uprising in Yemen are related to economic, political and security grievances. Yemen is the poorest Arab state, with the worst economic and human development indicators in the region. The country has one of the most explosive population growth rates, the highest youth unemployment rates, and it’s one of the most food- and water-insecure entities in the world. An estimated 43 percent of its rapidly growing population lives below the poverty line. Political grievances, on the other hand, include rampant corruption, exclusion, abuse of power and stagnation. This daunting set of economic and political problems is compounded by serious security crises. During the last decade, the map of Yemen became dotted with pockets of violence and civil unrest in the eastern, northern and southern parts of the country. Each of these pockets created its own orbit of conflicts, public distrust and deep social grievances. Yemen is a divided country in which, according to numbers by Integrated Regional Information Networks (www.irinnews.org), violent ethnic conflict claims the lives of approximately 2,000 people every year. How, if at all, would you say that interethnic tensions factor into the current protests? Dr. Fattah: In Yemen, ethnicity is not a yardstick of measurement. Instead, tribal, regional and sectarian identifications make the borders of Yemen’s socio-cultural map. These three main levels of identifications shape the ordering of loyalties and the understanding of Yemenis of their positions in the social and political structures. However, these divisions are politicized, transformative and highly contextual. For example, in the Shiite Zaydi militant insurgency in the northern province of Sa’ada, known as al-Houthi rebellion, which has been on and off since June 2004 and resulted in thousands of deaths and hundreds of thousands of internally displaced persons, tribal, sectarian and regional levels of identification were overlapping and blurred. It is important to keep in mind that Yemen is plagued with violence that goes beyond sectarian violence and the al-Qaeda threat. Disputes over land and water resources claim the lives of approximately 4,000-5,000 people every year. Scarcity, resource depletion and collapsing national economy are the main pipelines for feeding conflicts and instability in Yemen. Closely related to the previous question, how relevant do you believe ethnic cleavages to be not only in the current protests but also the future political development of Yemen? Dr. Fattah: Regardless of the orientations and interests of the internal and external actors involved in finding an exit to the current dilemma in Yemen, no restoration of order and diffusion of tension can take place without addressing the grievances which fuel instability and violence. One of the best scenarios under discussion is the introduction of a federal system that promotes political, economic and social empowerment at the local level. The scenario also includes opening the labour market in the Gulf region for accommodating Yemeni workforce. Worth mentioning here is that during the months of Yemen’s uprising, being a Yemeni has been an emotional and intimate experience that is more powerful than sub-national identities. When we refer to the ‘Arab Spring’, are we generalising the complex problems individual to each Arab country which have recently erupted in protest? Dr. Fattah: Yes, indeed. The media has been treating the ‘Arab Spring’ in a snapshot fashion, which is in my view a simplified, reductionist and crude generalisation. The ‘revolutions’ in the Arab world are not a duplication of those that took place in Eastern Europe in the late 1980s. Each uprising in the Arab Middle East has its own historical, socio-cultural, economic, strategic and political contextual particularities and consequences. Is there any lesson policy-makers and scholars can draw from the current developments in Yemen with regards to favourable or unfavourable conditions for democracy and democratisation in ethnically diverse societies? Dr. Fattah: There is one important lesson to learn from the ‘Arab Spring’, which is listening to what the massive young generation in the region have to say. Reaching out to the Arab youth should be a priority for bridging the present and future relations between the western world and the Arab world. As for Yemen, no transition to democracy and socio-economic recovery can take place without addressing the structural root-causes of the security crisis.